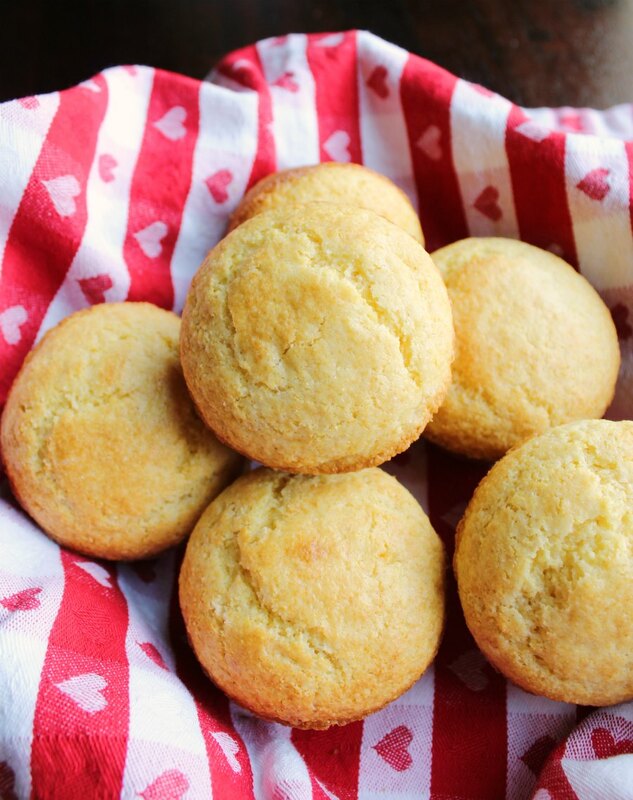 These Homemade Corn Muffins are made from pantry staples. They are just a bit sweet and have a perfect cornbread crumb. They are so easy to make from scratch, why worry about the box? These slightly sweet corn muffins are the perfect side to so many bowls of soup. They are also great with butter and or honey. They are super easy to make and are made from scratch with just a handful of pantry staples. Be warned, I am on a bit of a cornmeal kick. I don't know what has gotten into me, but everything has to have cornmeal in or on it. I had been buying small packages of cornmeal, but we have also been on a bit of a homemade pizza bender and I like to sprinkle some cornmeal on the pan. So I decided it was time to just but the big bag of cornmeal. Now that I have five pounds of cornmeal in the pantry, it seems to be calling to me. First, instead of just sprinkling the pan it was begging to be used in a crust. So I tinkered with a cornmeal pizza crust on a taco pizza. It was good, but could be better (and I did a terrible job of writing down exactly what I put in it!) so it is not a blog recipe... yet! That actually not the first time I have tinkered with putting cornmeal in a crust. In fact I've put it in a pie crust along with some apple cider for and apple slab pie. I've also made a savory tomato slab pie with a Parmesan cornmeal crust that was REALLY good and I can't wait to make another when it is tomato season again. 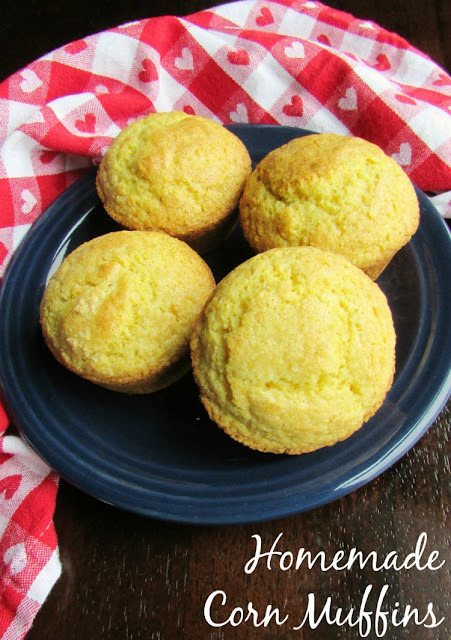 All of this has nothing to do with these corn muffins other than to show that I seem to have a thing for cornmeal and it has become a pantry staple. While the little boxes of corn muffin mix do make it super easy, you have to actually have them in the pantry when you want them. That is the part I am miserable at. I don't seem to be good at keeping mixes on hand and sometimes I just need something on the fly. The thing is making the corn muffins from scratch really isn't any harder than opening the box and there isn't a single ingredient in theses that I don't always have. Beside homemade is always a little better and you can adjust the sweetness to you liking. I love mine a little sweet. I don't want them to be cupcake sweet, but I do like a little of that sweet and salty going on. 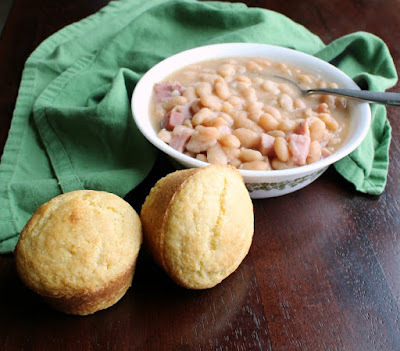 That way it can find itself right at home in a bowl of ham and beans but is also amazing slathered in butter and honey. And now I'm hungry. Again. I guess I better grab a muffin! 1. Preheat your oven to 400 F and grease a muffin tin. 2. Stir together the flour, cornmeal, sugar, baking powder and salt. 3. Add the oil, egg and milk and stir until just combined. 4. Spoon into prepared muffin tin and bake for 15-20 minutes or until golden brown. It seems silly to get the box when homemade is soooooo easy too. Thanks, Jessica! Oh Carlee, we're clearly friends for a reason! I'm kind of in love with corn muffins and I like them just a touch sweet too. These look awesome! You are going to laugh, but I literally just sent this link to my husband and said I know you want these right? Big huge YES he does, he is crazy for cornbread muffins! ha! Well Mr. Nine deserves some corn muffins for sure! I hope he enjoys them! Oh!! How easy this sounds and Homemade is always the best. Thanks Carlee. Your Corn Muffins look great! Thanks so much for sharing your awesome recipe with Full Plate Thursday. Hope you have a fantastic weekend and come back soon! Yum Carlee! 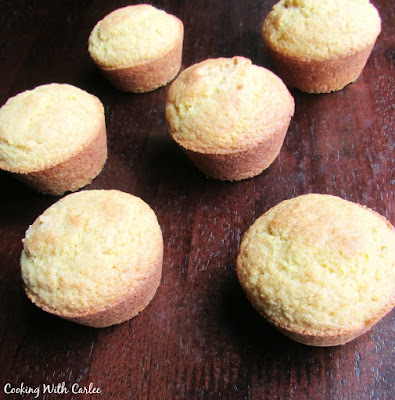 I love cornbread muffins and these look perfect! 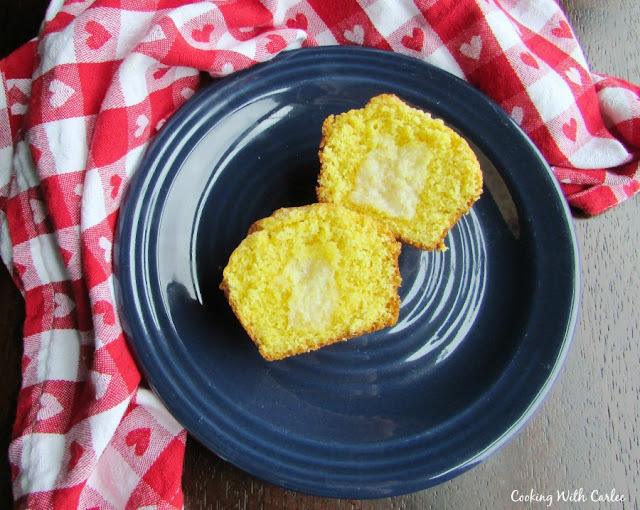 Wow, I just realized how long it's been since I have made cornbread! I tend to prefer a sweeter recipe as well, but somehow always end up with them not sweet enough! Trying your recipe... Just told husband about them, and I think it will be tonight!